Every woman plans for the big wedding day. Few plan for the day after. But once the cake has been cut, the dress has been worn and the band has played its last song, a marriage begins. 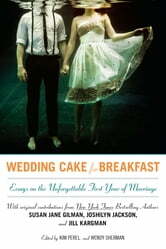 From the thrill and dread that comes with an unplanned pregnancy to catching up with an ex and having second thoughts, Wedding Cake for Breakfast*** ***offers an intimate and often surprising look at that first year of marriage through the eyes and lives of 23 acclaimed women writers. With humor and candor, this collection takes readers behind closed doors for close-ups and personal glimpses into the emotional joys and complications of creating a life together—all the while blending families, furniture, and traditions for the very first time. Gathered together in this hilarious and heartwarming anthology some of today’s most renowned female voices, including New York Times bestselling authors Susan Jane Gillman, Joshilyn Jackson, and Jill Kargman, share their most touching and illuminating stories from the first 365 days of matrimony.